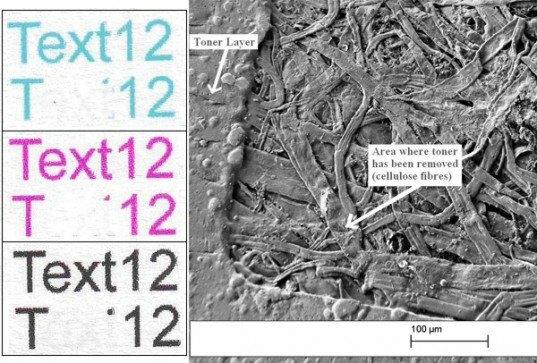 A team at the University of Cambridge has developed a remarkable new technique that uses lasers to erase laser-printed paper, leaving pages clean, clear, undamaged, and ready to be reused. The technology has the potential to be even more eco-friendly than traditional paper recycling – scenarios suggest that it would produce at most “half the carbon emissions of recycling; best-case, unprinting is almost 20 times as efficient,” reports ExtremeTech. Laser printing is a standard technology used in offices the world over that works by placing positively charged pixel regions onto paper, to which negatively charged toner sticks before it is heat sealed onto the surface. The University of Cambridge’s unprinting technology takes that sheet of paper and applies a “laser energy level that is high enough to ablate – or vaporize – the toner that at the same time is lower than the destruction threshold of the paper substrate,” according to New Scientist. The team’s lead author David Leal-Ayala added: “Toner is mostly composed of carbon and a plastic polymer. It’s the polymer in the toner that is vaporised.” So far, the scientists have found that the unprinting method can be used successfully on the same sheet of paper two or three times before the paper begins to yellow. A team at the University of Cambridge has developed a remarkable new technique that uses lasers to erase laser-printed paper, leaving pages clean, clear, undamaged, and ready to be reused. The technology has the potential to be even more eco-friendly than traditional paper recycling - scenarios suggest that it would produce at most "half the carbon emissions of recycling; best-case, unprinting is almost 20 times as efficient," reports ExtremeTech.